These recessed fixtures are in my alma mater's chapel. There are 14 of three different sizes. 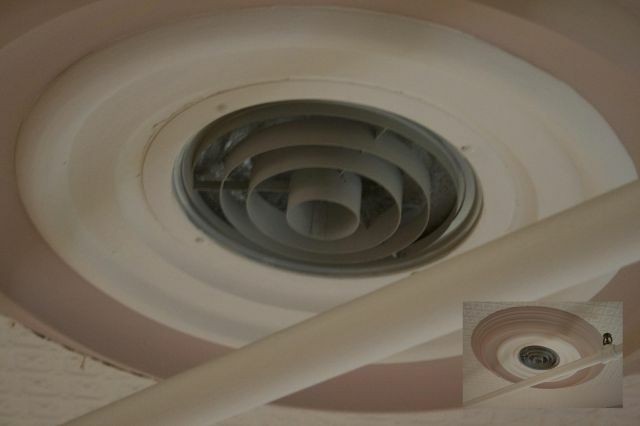 They were installed around 1955-1956 during renovations. They were originally incandescent but converted to MH in 1998. I once talked about them with the maintenance head and he told me they were each 1000W incandescent. The building is made of wood, and after a while when they were all running, it started to smell like overheated wood in the attic. He told me they reduced the wattage with MH simply by adding ballasts in the attic (they are accessible from there). If I remember correctly, the largest are 400 watts and the two smaller sizes are 250W. I only have a key to the balcony so my photography of these lit up is limited. The louvres appear to be painted light grey and there is a frost-patterned glass (not standard frosted glass) lens above the louvre. The MH does a much better job at lighting the chapel than the incandescent did. All photos are brought to you by Bubby industries. These look cool. Remind me of smaller glass lenses cans. I see you learned how to use Lenny face. Any machine is a smoke machine if you operate it wrong enough. Yes, the lamps are enclosed. There is a flat glass that has a texture similar to the patterns frost makes on cold windows in winter. If you look closely at the full size picture you can see the texture between the rings. You cannot make out the shape of the lamps (BT or ED) through the glass, nor can you clearly see the arc tube. All lamps are clear, though. If I remember correctly, the glass was present with the incandescent lamps as well. I am not sure if the glass is original or not but I found a reference to textured glass above concentric ring louvres somewhere on the net (a scanned document from the 1940's or the 1950's). Wow, 14000 watts of incandescent light is pretty impressive. Hence the overheated wood smell. I imagine it made a small différence in the power bill but not much as these weren't used that much. If the room was used in the daytime the lights were mostly kept off. The stained glass windows aren't that dark so there is a lot of daylight. Now with the MH they are used a bit more in the daytime. Of course they are used at night when the room is in use. Unfortunately, there aren't any provisions for standby lights during a hot restrike. Oh, and the 14 000 watts of incandescent, how impressive it was, was not quite enough for the size of the room. According to the Lumen to Watt calculator the equivalent to 1000 watts incandescent would be about 175 watts MH. The combination of 250 and 400 watt MH lights it up quite nicely. Really? When I got my 175W MH lamp, I compared its light output to that of various A and PS-shaped incandescents, and I found that around 500W was equivalent. Could you try to get a pic of the whole building with the lights? I really want to see what they all look like. @TheMaritimeMan : I haven't made any real life tests, I just went by what I was told and what the lumen calculator gives. You might be correct, and other factors would change some parameters like the reflector, the position of the filament or arc tube in the reflector, etc. Nevertheless, the MH lamps in this room give more light than the incandescent did. At least some of the incandescents were on dimmers, but at full brightness it was still quite dim in there. @Zarlog : I can't promise as I am not there often (in that part of the building). If ever I get the chance to do so, I'll post here. Actually, 1000W incandescent lamps are equivalent to a 250W MH lamp (~23000L; the same as a 400W MV lamp) so the 250W MH lamps are a lumen-match. The 400W MHs are 36000L but they'll dim down to about 32000L by EOL. Remember that as lamp wattage increases, LPW increases. Roughly speaking, MV is 2X as efficient as incandescent. To resist is to piss in the wind, anyone who does will end up smelling.